This 3-in-1 reversible tote is the perfect combination of style and function. The interior pouch is fully lined and includes a zippered compartment, as well as several additional zip and slip pockets to hold all your necessities securely. A detachable adjustable strap is included to convert the pouch into a crossbody you can wear on it's own. 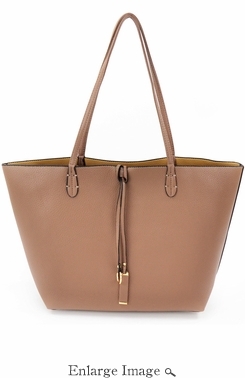 The possibilities are endless with this tote and will easily become a wardrobe staple for years to come. 11" High, 16.5" Wide, 4.5" Deep; 10" strap drop. Details: 11.5" High, 17" Wide, 4" Depth; 10" Strap Drop.